The ancients used the metaphor of a painting on a Canvas, as a map to describe how we may return to the direct experience of our True Self. Our true Self is just behind the Canvas, on which we paint countless false identities. Following is a pictorial description of this symbolism. Remembering the Canvas is a very practical tool for Yoga Meditation and Meditation in action. Our true Self is just behind the canvas, on which we paint countless false identities. Where is the real Meditation? Imagine a Canvas, on which there is no painting yet. When the Oneness starts to manifest, first there is a Canvas. Everything else grows outward from that. In Sanskrit, the name of this primal level of manifestation is "Kutasta". It comes from the root word "Kuta," which is an anvil. It is on the anvil called Kuta that the blacksmith fabricates the creation. Before applying the paint, the artist will sketch an outline on the Canvas, such as can be done by using a pencil. It gives shape to what will come. In the human, this is like our deep predispositions that lie latent in the basement of the mind. The artist does not go directly from sketch to finished painting. Rather, there is a process of outlining in light colors, forming shapes, and starting to fill in the sketch. In the human makeup, there is a vast unconscious process between the root predispositions and our external expressions through body and personality. This inner process is going on at all time while we are awake and is the dominant mental process during dreaming sleep. The finished painting, enjoyed in all its beauty, is a result of the Canvas, the pencil sketches, and all of the layers of intermediate colors, outlines, and preliminary colors. All of those are still there, on the Canvas, underneath the final painting. Yet, when looking a painting, pretty or ugly, we forget the undercoats of paint, we forget the pencil sketches, and we forget the Canvas. In the same way, we forget the layers of ourselves, and our True Nature, as we engage in the external actions of the world. Once the painting is done, and we are living life, there sometimes comes a call to search for more, and we encounter, learn and begin to practice Meditation. It is common that a student of Yoga Meditation learns to work with lifestyle, stilling the body, allowing the breath to be smooth, and quieting the conscious mind, but still not experience the depths of Meditation. What often has happened, is that we closed a curtain over all of that troublesome stuff of the mind, but then we wonder why we are not progressing in Meditation. We sit "outside" waiting for Truth, Grace, God, Guru to come, and nothing happens. For years, decades, we can sit relatively still and quiet, after having done the lifestyle preparation for spiritual pursuits. We end up either thinking that this stillness alone is the end of Meditation, or we quietly wonder, "What's wrong with me? Where is the real Meditation?" Gradually we start to look at the painting that we, ourselves have created. We turn inward, as if trying to find an inner window that leads to Truth. We come to see the error of creating and closing that curtain over the conscious and unconscious mind. 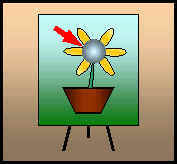 There are really only two directions to look, either away from the painting, or into the painting. We try our best to attain happiness and joy by turning away from the painting, or even to find God "out there". Ultimately, it seems, we are forced back to the easel where we have set our painting. Before looking for Truth itself, we first look for the Canvas, though we may not be aware this is what we are looking for at the time. In finding the Canvas, we see the elegant way in which we have painted our own lives on the Canvas, starting with the pencil marks, then playing with the colors and forms, and finally bringing forth the reality we call "me" in relation to "the world". To find the Canvas is not a matter of eliminating the painting, the creative process underneath, or the pencil marks of samskaras. Rather, we come to see the Canvas underneath the painting, where it has been all along. This is a real key to Yoga Meditation. We must be aware of, seek, and find the Canvas, which is beyond all of the activity of the conscious mind and the gross world, and also behind, underneath, or the screen for the projection of all of the unconscious, subtle, psychic, or astral action of the universe. However, we can never find the Canvas, or Truth beyond, by trying to turn away from the painting. We must turn inward, squarely facing the painting, so as to find the Canvas. How do we go about looking for the Canvas? First, we deal with the external reality of which we are a part and which we have created. In Yoga Meditation, it means accepting the process of the conscious mind, rather than suppressing it. It means taking on an attitude of being an explorer, an interior researcher. We are on a quest to uncover that which is underneath the painting we have created. It is not that there is anything "wrong" with, or "bad" about our painting. Rather, what we are looking for is underneath the picture; whether we think our painting is a pretty picture or an ugly picture. This is a gentle process, not an invasive way of rooting out our unconscious. By being aware of the fact that we are trying to systematically go through the layers of the painting to the Canvas, the process can unfold at a proper, healthy rate. The important thing is that we are intentionally turning into the painting itself, not putting a curtain over it. Gradually, we come to experience the unconscious mind, that which is normally experienced only in dreaming sleep. Here, we really learn the importance of cultivating the practice of one-pointedness of the mind, and its companion, non-attachment, as we learn to not get entangled in the stuff of the unconscious mind or the subtle realm. We come to see the process by which our finished painting came into being. This journey can be a little bumpy, as we see, in retrospect, how some of those turns we took in the road of life were not so useful. However, we continue on, since we are looking for the Canvas. As attention moves past the gross world and past the unconscious process, we come to the deep grooves of the unconscious, the sketches on the Canvas. These are the samskaras, the driving force of karma, in their latent form. Ironically, as we move past all of the colors and forms moving around in the creative process, we come to a sort of stillness when we see the sketches of the painting in their initial form. In this process, the samskaras, the sketches weaken. There is little pain here and little pleasure in the external sense; just a quiet sense of "peace of mind," as the "mind" has come to rest in coming to the level of sketching. With stillness, we find the Canvas on which the three parts have been drawn (sketch, process, and painting). From the very beginning of Yoga Meditation, this is one of the most important things to remember--the Canvas. In remembering the Canvas, we do not suppress thoughts, emotions, images, impressions, or sensations during Meditation. It is truly possible for one to remember the Canvas on which all of the dramas of our lives are playing out. Anybody can practice remembering the Canvas; it is not some technically difficult practice, though it is profoundly useful for one inspired to do it. Sadly, few do so. Remembering the Canvas does not mean that our challenges of life, mind and emotions suddenly disappear. No, they are still there, while we cultivate an ever increasing awareness of the Canvas that exists underneath. While we are "remembering" the Canvas, gradually the impact of the dramas in the painting become weaker, as they play themselves out externally and internally. While it is essential to find the Canvas, we sense that there is something more, beyond even the Canvas, on the other side of it. We may not see the other side of the Canvas, but we wonder, "Where did this Canvas come from? Knowing the Canvas is peaceful, still, silent, but there is something more -- What is that?" With patience, practice, and persistence in a spirit of passive volition, we come to see through the window in the Canvas to get a glimpse of the Truth that is on the other side. We come to see that the Canvas itself is the product of Truth. The Canvas manifested out of pure Consciousness for the sole purpose of creating a field or playground. It manifested this field so that one can play by painting their art, including each of the sequential stages of sketching, filling in, and having the finished painting. Truth is behind our external world and conscious thoughts. Truth is behind our unconscious process and the subtle realm. Truth is behind the sketch marks of our samskaras that form our individuality. Truth is behind even the Canvas of creation or manifestation itself. However, we also come to see that the only way to get to the Truth behind the painting is to go through all the layers of the painting, so that we can first find the Canvas. The more we notice the Canvas, the more we notice that the Truth is hiding right in the middle of life. 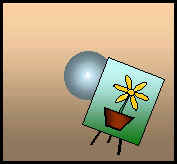 This metaphor of the Canvas is a very practical tool in daily life. While enjoying the paintings of life, we can be ever mindful of the Canvas on which our mental, emotional and perceptual processes are playing out. The more we remember the Canvas, the more easily we remember the Truth behind it. At the time of seated Yoga Meditation, we intentionally look for the Canvas behind all the stuff of the mind, not suppressing the thought processes. We are trying to allow the object on which we are meditating to lead us back to the Canvas, and to the Truth beyond.